it was a touching episode – chihaya choosing to support her friend to win the B-class championship rather than watch and learn from the battle between two karuta geniuses. It’s too bad they don’t have a little extra money for a videocamera in the club budget. Yuusei could be recording it for them to review later. that’s true… but chihaya will be able to watch it… at least the second part of the game. thankfully taichi won fast enough for them to see the climax of arata and shinobu’s game. Yeah, we still have that to look forward to! I’m guessing that Arata wins and that sets up the reveal that he is moving to Tokyo, thus motivating the premise of the third season, which will kick off with the preparations for the Meijin and Queen matches. that is something to look forward to. but they still have a year in HS before arata would be able to move to tokyo. he said he’d study in a uni in tokyo. so i presume he’s only moving when they enter college. Way to bring me down! Still I guess I shouldn’t get my hopes that high. hahaha! i apologize. i didn’t mean to put your hopes down. I guess Taichi had some luck leftover after all! – or perhaps, more accurately, he no longer relies on luck to advance. 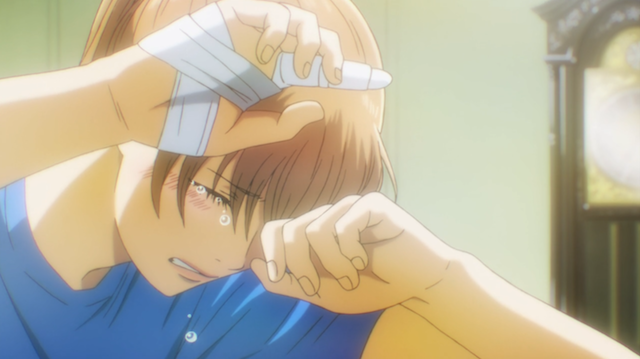 I loved how Chihaya’s absence and presence is so revealing in how it affects Taichi’s game; it also further builds on the lingering question of why Taichi plays Karuta, why he tries so hard, what drives him, and what he hopes to accomplish. I really, really hope there’s a third season. These first two seasons focused more on the high school team and individual matches, so there’s a good chance that a third season might focus on the Queen and Meijin matches – which may be between our main characters, now that Arata has more than a fighting chance at beating Suo, Taichi’s made Class A, and … well, depending on how Chihaya’s injury heals, she’ll likely be a challenger to Shinobu! I agree that the story has gotten to an interesting point. All of these great players, and many of them have been very well established already. I’m glad Taichi’s luck held up, or whatever it was that got him to A-rank. It definitely makes his story have meaning, and also opens the way for Desk-kun and Kanade to advance.